The space shuttle flies in April. Would you like a call when it soars over your backyard? Spaceweather PHONE! AURORA SPRING: Today is the first day of northern spring--a.k.a. the "vernal equinox." This is good news for sky watchers because, statistically speaking, equinoxes are the best times of year to spot auroras. A solar wind stream is due to hit Earth on March 24th, so stay tuned for Northern Lights. BONUS: Inspired by the coming of spring, artist Mark Siebold created a pastel interpretation of Earth's 23.5 degree tilt. The reason for seasons has never been so beautiful. VENUS AND THE MOON: Actually, her name is Sabine. "Last night, my girlfriend posed for this shot on the beach at La Torche," explains French photographer Laurent Laveder. "I call it Moon Temple Guardian." 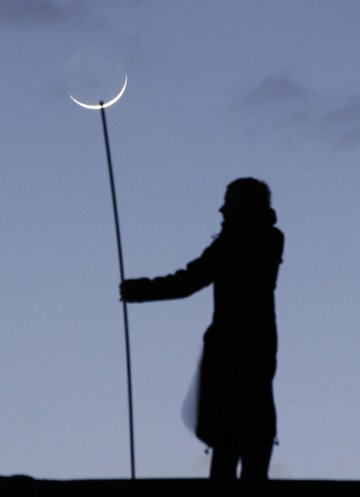 Photo details: Canon 30D, Sigma 70-300mm lens, 1/4 s.
Sabine and Laurent had lots of fun with the crescent Moon; they caught it in a net, lassooed it, and threw it like a boomerang. Click here for a gallery of images. Tonight at sunset, the crescent Moon will appear again hovering just above the planet Venus: sky map. What will you do? Above: An H-alpha image of the sun from Japan's Hinode spacecraft. 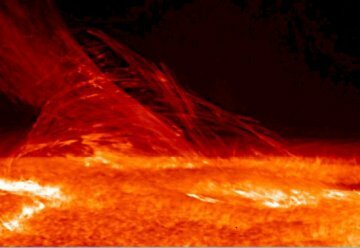 The footage is visually stunning, but the most surprising thing is where the scene unfolds--in the solar chromosphere, a layer of the sun's atmosphere previously thought to be relatively uneventful. Get the full story from Science@NASA.